Our theme was chic garden party, so while silver and china were prominent, we mixed and matched plates and glassware to keep it from looking too formal for the backyard garden setting. Wedding season is in full swing and as a floral designer, the pressure is on to create beautiful bridal showers that guests will enjoy (and want to Instagram!). Here are a few tips on how to be memorable without breaking the bank. 1. Choose an inspirational element and let it guide your color, style and design. Decisions and selections will be much easier with a plan, so try to create a cohesive vision and designscape. 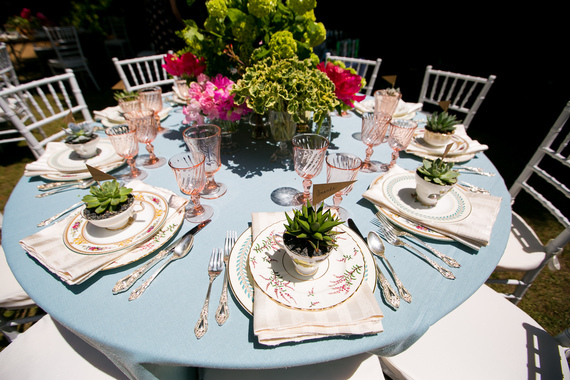 Here, we started with china patterns and used those colors to coordinate table linens, glassware, floral arrangements, balloons and party favors. 2. Combine rentals with family heirlooms to keep costs down. 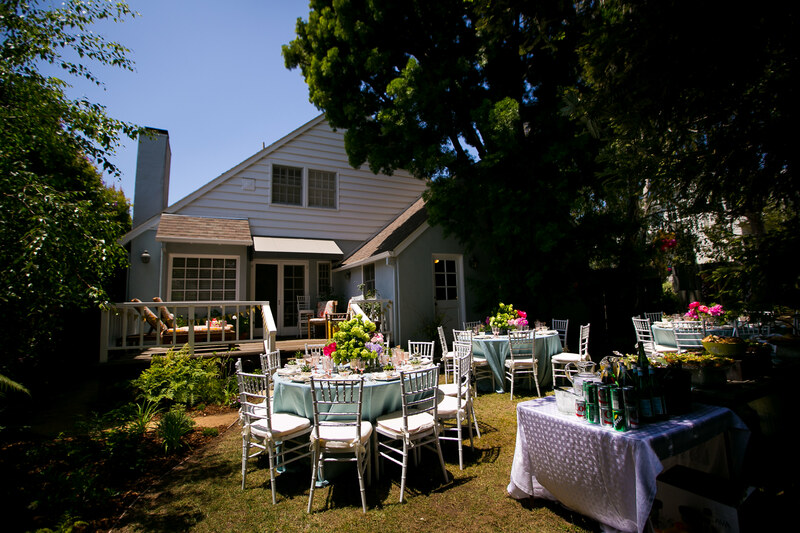 Since we wanted an intimate, outdoor setting, we decided to host the shower at our parents' home. This granted us more design and menu freedom than hosting at a restaurant but we had to figure out table-settings for all our guests. 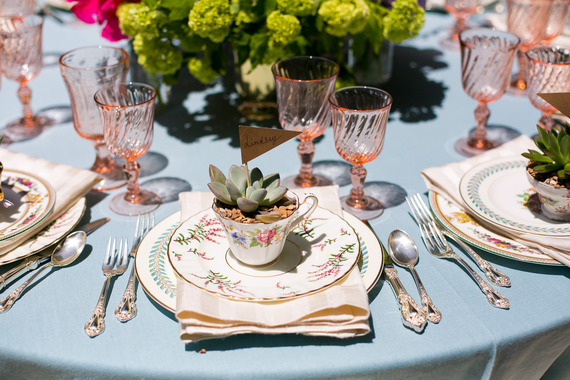 Our cost-efficient solution was to rent glassware but use our grandmother's china (thank goodness she had three full sets!) and silver, which was not only gorgeous but saved us at the bank, too. When it came to party favors, we wanted to think outside of the ever-popular macaron box. Sticking with our "garden chic" motif, we collected vintage teacups and planted succulents in them, which then doubled as place cards. 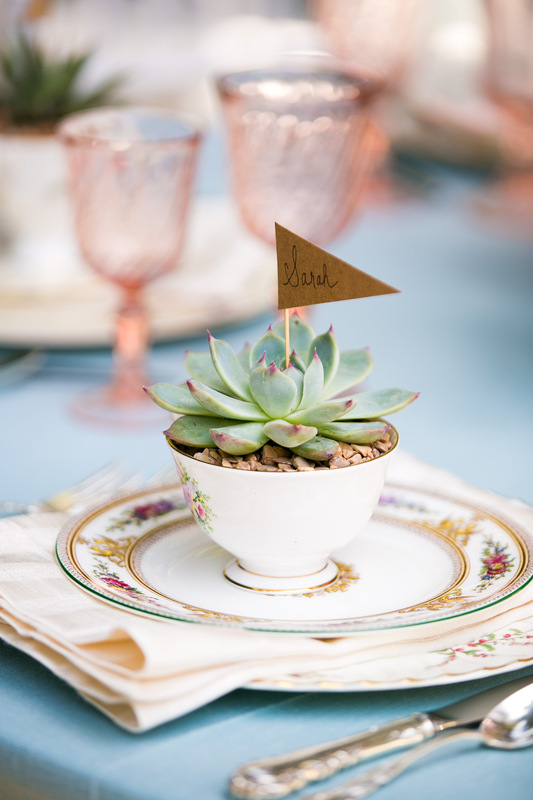 Not only did our gifts delight our guests, but the components were inexpensive and accessible: succulents typically cost around $3 each, and teacups can be found at thrift shops, on Etsy or on eBay. As a bonus, guests can replant the succulent and reuse the teacup! 4. Simplify the floral arrangements. Instead of singular centerpieces, I decided to create displays that were much faster and easier to make. I dug into my collection of small, interesting containers and bud vases and used them as vessels for the florals. You can find similar, budget-friendly containers but note that you will need quite a few of them or your display will look skimpy. 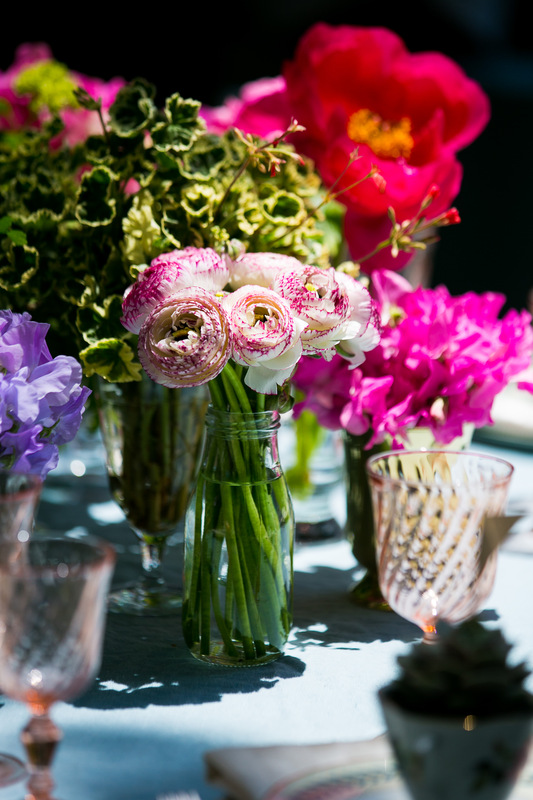 I chose the bride's favorite flowers - sweet peas, peonies and ranunculus- in colors that coordinated with the rest of the design elements to complete the look. Big fluffy stems of viburnum, variegated geranium, and maidenhair fern added bright, fresh greenery to the mix. These plants are not as pricey as flowers yet add a lot of volume and contrast. 5. Get out of the vase with the decor. 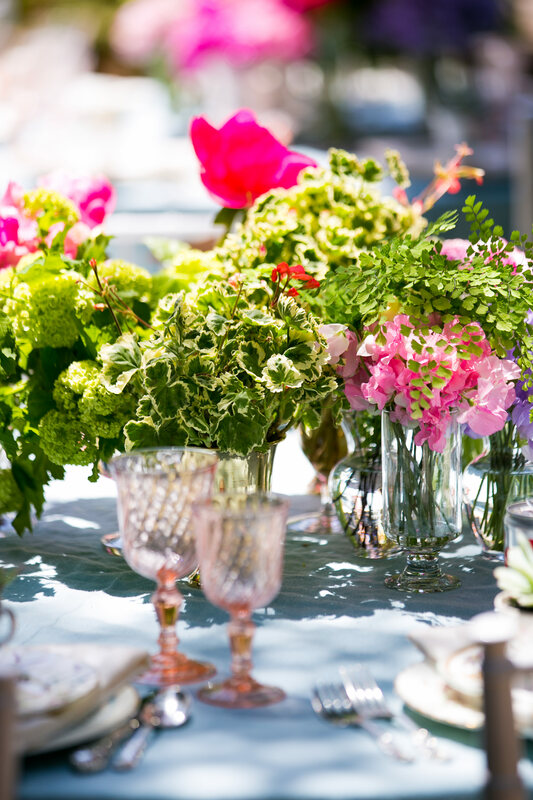 Flowers can be used beyond centerpieces and displays -- use them to decorate your buffet and garnish your plates! Many flowers are edible and can be found at the grocery store and at the farmer's market. Keep an eye out for these colorful packages and use them in salads or to make your plates pretty. 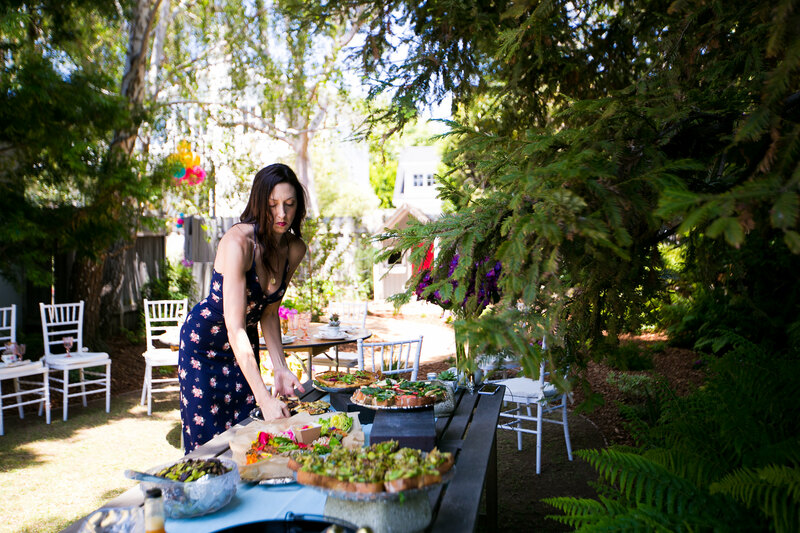 We sprinkled petals on fruit salad and French toast, and placed a giant vase of Dutch hydrangea at the food & beverage area. 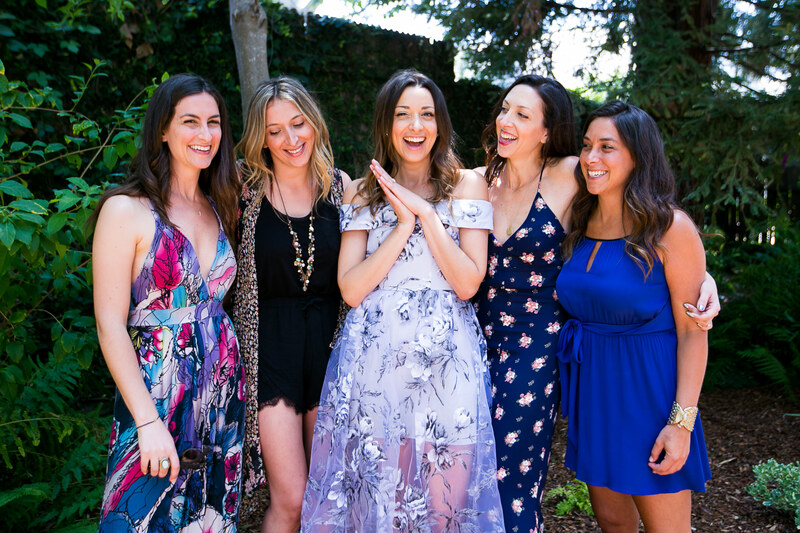 Bridal showers are joyous occasions so try to keep stress at a minimum. Things might not go exactly to plan but if you smile and are at ease, your guests won't know the difference. At the end of the day, pour a glass of champagne, have fun and cheers the bride-to-be!